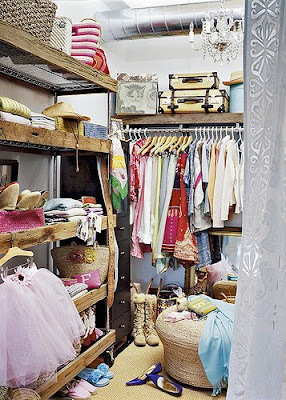 Here's your Monday closet tip, along with some inspiring closet eye candy. Last Monday's tip was easy come, easy go, which is to say if you don't spend a lot on your clothes in the first place, it's easier to get rid of them when the time comes. This week's tip: Your closet is a lot like American Idol. Researchers say that we can only hold five items in our active memory. In a similar way, we can only hold a maximum of 10 outfits in our closet memory. 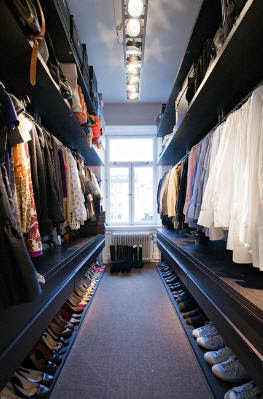 Take a look at your closet and think about which items you wear on a consistent basis. No matter how much stuff you have, you'll tend to wear the same few outfits over and over again. That's because they are comfortable, look good or are easy to pull together. It's a law of nature that if you add a new great outfit, one of your former favorites will drop off the other end. You will never exceed 10 good ones. The trick is to identify your top contenders and more or less get rid of everything else. To do that, your clothes must audition. 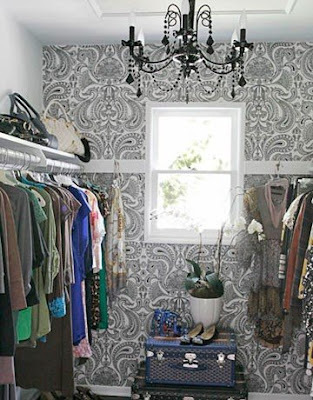 Closet organizing experts will tell you to divide your clothes into 'yes', 'no' and 'maybe'. That's the easy part. Now what to do with the 'maybe' category? Run them past your three internal judges. Paula: It's not terribly flattering on you. But an empire* waist is very popular right now. And if you stand up straight and hold your shoulders back, it really doesn't look that bad. You really do have a budding eclectic taste. Keep developing that. Randy: It's just awright for me, dawg. Simon: I wouldn't bury a dead ferret in it. The Simon voice will become more sharply insistent as the contest continues. Take your 'maybe' outfit and place it front and center in your closet. Make yourself wear it some time in the next two weeks. If it survives that round, make yourself wear it again within the following two weeks. By now, you either love it or hate it. More likely, you hate it. Actually wearing the outfit will bring back to memory why you haven't been wearing it all along - it itches or it's lumpy or too tight or makes you look washed out in the office bathroom mirror. Ditch it and bring your next 'maybe' outfit in for an audition. You may find a Jennifer Hudson in there. Here's betting you've also got lots o' William Hung. *For you Pennsylvania Dutch out there, this is pronounced ahm-pire. Good god... a chandelier in a closet. "Out of my league" doesn't even begin to describe it. I'll stick to decorating with... sticks. How is that working out for you, by the way? That was so much fun reading - and helpful too! You're right, you choose not to wear clothes for a reason. I have quite a few really nice evening tops for special nights out. But nights never seem special enough and I always feel overdressed when I try them on. So back to the same old less-revealing, more sophisticated and simple black top. Should I throw the other ones out? 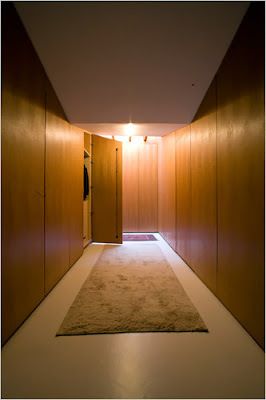 By the way, you have given me so much inspiration over the past weeks that I spent my whole weekend building/decorating a walk-in-wardrobe which is starting to look really cool. Finishing touches will be done by the end of this week!! Karen, we had a rainstorm yesterday, so I will be checking the park today for sticks.